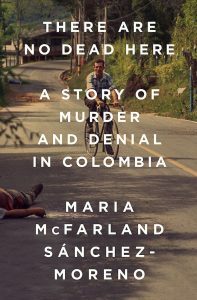 The Duke Human Rights Center@the Franklin Humanities Institute and the Human Rights Archive at the David M. Rubenstein Rare Book and Manuscript Library have named María McFarland Sánchez-Moreno’s book, There Are No Dead Here: A Story of Murder and Denial in Colombia (Nation Books, 2018) as the winner of the 2018 Juan E. Méndez Book Award for Human Rights in Latin America. McFarland will visit Duke University during spring semester 2019 to accept the award. There Are No Dead Here is a deep dive into key human rights cases that exposed the murderous nexus between right-wing paramilitaries, drug lords, and Colombia’s military and political establishment. Through dogged reporting, in part as a Human Rights Watch researcher, McFarland unravels the links that led to the murders of Colombian rights investigators by powerful interests that reached as high as military leadership and even the Colombian presidency. First awarded in 2008, the Méndez Human Rights Book Award honors the best current, fiction or non-fiction book published in English on human rights, democracy, and social justice in contemporary Latin America. The books are evaluated by a panel of expert judges drawn from academia, journalism, and public policy circles. Other judges include Kia Caldwell, Associate Professor of African, African-American, and Diaspora Studies at UNC-Chapel Hill; and Kirsten Weld, John L. Loeb Associate Professor of the Social Sciences in the Department of History at Harvard University.